Patio Screen Enclosures. 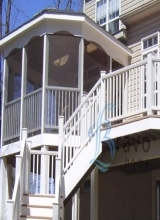 Patio Screens by Bravo. Complete Insect Protection. Bravo manufactures flexible insect screens that can be used on windows, doors or almost any of application. Our products can be used as patio screen enclosures because they are durable, resilient and provide the ultimate protection for you and your family. All of our products are custom manufactured according to your measurement. Therefore, you can sure a perfect fit every time. In addition, they provide an optimal seal to protect your windows, doors, patios and living space from bug and insects. 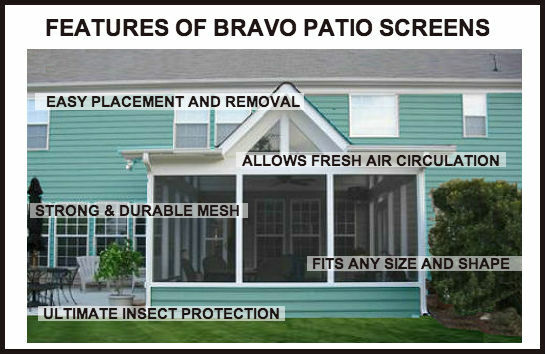 Bravo insect, bug or mosquito screens are easy to install. Their Velcro fastners ensure that your screen will securely attached and will not come loose, blow off, break, shrink or even stretch. They will not move until you want to remove them. They require minimal maintenance and are easy to install. They require no professional installation or tools required. Our products are durable and fabricated with a specially formulated vinyl coated fiberglass that ensures a longer lasting color and flexibility. Bravo mesh is stiffer than regular fiberglass mesh, which ensures a stronger and longer lasting product. Our products are ideal as a patio screens because they allow fresh air circulation, but at the same time keeps bugs and insects out. Thus, we are able to keep your rooms, patios, and living spaces cool and comfortable. Patio screen enclosures are a great option for the summer to keep your space free from bugs and insects, as well as a relaxing and secure area. Our products are also ideal for windows, doors, pools, RVs, cars, motorhomes, pool areas and other openings.